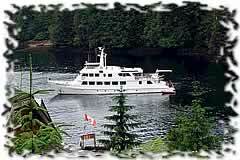 The 116' Nautilus Explorer was launched in 2000 as an expedition yacht and is a very spacious vessel specifically built to cruise B.C. and Alaska in all weather and in great comfort. Guests often comment on the smooth and quiet ride and how nice it is to be on a new, well designed and spotlessly clean vessel. Diving is our passion and we offer specialized dive trips from March through November. Visits to Port Hardy, Hakai Pass, the Queen Charlotte Islands and the outer coast of Alaska are all on our dive schedule as well as the old favourites like the Gulf Islands, Race Rocks and Campbell River. Your safety, comfort and enjoyment are our biggest concerns. Our vessel has every kind of Coast Guard certificate you can imagine including SOLAS certification for international voyages, a Load Line Certificate, Health Canada and U.S. Public Health Service approval and a ISM certificate issued by Lloyds Register. My wife Mary Anne, our crew and I invite you to explore both our website and our unique part of the world. We hope that you will join us. Located in the beautiful seaside town Loreto, Mexico, Dolphin Dive Center offers all the scuba diving conveniences of a PADI International Resort. A full service facility in the Loreto National Marine Park, Baja California Sur, Mexico. Dive excursions, rentals, land tours, whale watching, and discount hotel packages are only a 90 minute flight from Los Angeles or San Diego! 80-85F water temp. in summer. Don Jose Live Aboard and Rio Rita day boat - They are located in downtown La Paz and offer a variety of excursions to the Pacific side of Baja for whale watching and single and multi day diver trips on the Sea of Cortez. 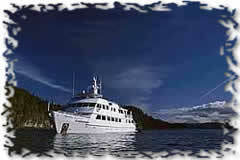 This dive operation is known for its experienced dive masters and fantastic food served on board their boats. Since the boat rides back to La Paz can be long, expect a good time with Margaritas and Pina Coladas being served all the way into port. Located at Club Cantamar Resort - Located at the out skirts of the Bay of La Paz and offers the shortest trip out to the dive sites. They are a short 15 min. cab ride outside of town and have a restaurant and pool at their resort. The Sea of Cortéz is well known worldwide for its excellent conditions for scuba diving. No other area gathers more magnificent dive sites than the surroundings of La Paz, with three of the most beautiful islands in the gulf, San Jose, Espiritu Santo and Cerralvo, plus countless tiny islets that contribute to a well earned fame of being a place where almost anything can happen at any time. There are 13 different dive sites and each is unique and exotic. The black coral reefs are teeming with life and the macro life is very close with schools of Manta Rays blocking out the sun and hammerheads schooling nearby as well. The privileged location of Cantamar Beach Resort, home of Baja Diving & Service, allows to cut in half the boat rides, insuring more quality time at dive sites. Amigos del Mar has been operating in Cabo San Lucas for over 18 years, making us the most experienced dive operators in Los Cabos. We take pride in the personalized service and unsurpassed safety we provide our clients. We are a PADI, SSI, NAUI, NASDS Dive Resort Facility offering daily guided natural history, scuba and snorkel tours, a variety of Certification Courses and introductory scuba courses, natural history sunset cruises and - in season - natural history whale watching tours. Our choice of dive sites will please every diver, from the novice to the most experienced. Cabo San Lucas is located at the tip of the Baja Peninsula, the longest peninsula in the world, about 30 miles south of the Tropic of Cancer. Because we are located at the exact point where the Pacific Ocean meets the Sea of Cortez, we enjoy marine flora and fauna indigenous to both bodies of water, making our dives a truly unique experience. We have an average rainfall of 6" per year. January to June average air temperature is around 80 degrees F° and average water temp is around 68 degrees F°. June to January average air temp is around 90 degrees F° and water temp 80 degrees F°. The water warms up nicely toward the end of summer and usually stays warm through December and into January.